In a season that has offered nearly everything, it’s time to throw another potential curve ball at the racers, courtesy of wild weather and altitude here in Denver. Round 15 of Monster Energy Supercross marks the first race in the mile-high city since 1996, and the open stadium makes this track susceptible to anything and everything. Massive snow fell here during the week, but the track crew shoveled it off, pulled the tarps, and found most of the track completely dry. Light snow fell last night but didn’t really make an impact, but then it started snowing again as practice started today. Will it eventually soak the track enough to make a difference? It’s already quite slick out there, it will be interesting to see if the track holds up as the snow keeps falling. This might sound like much hype about weather, however, every race here is still critical. Cooper Webb has a 21-point lead over both Marvin Musquin and Eli Tomac, which seems healthy with three races left, but there’s a good chance the “good” Eli Tomac shows up here. This is his home race, he’s in a good spot after winning last weekend in Nashville, and wow was he in a good mood when we talked to him yesterday. The 21-point gap puts Eli in a nothing-to-lose-but-not-out-of-it position, and it sounds like he’s quite comfortable in that spot. Don’t count out Musquin, either, as he logged the fastest time (with Tomac second) in free practice this morning. This 450SX title chase is definitely not over. Plus, you have the never-ending Ken Roczen watch, and riders like Dean Wilson and Blake Baggett going fast each weekend. 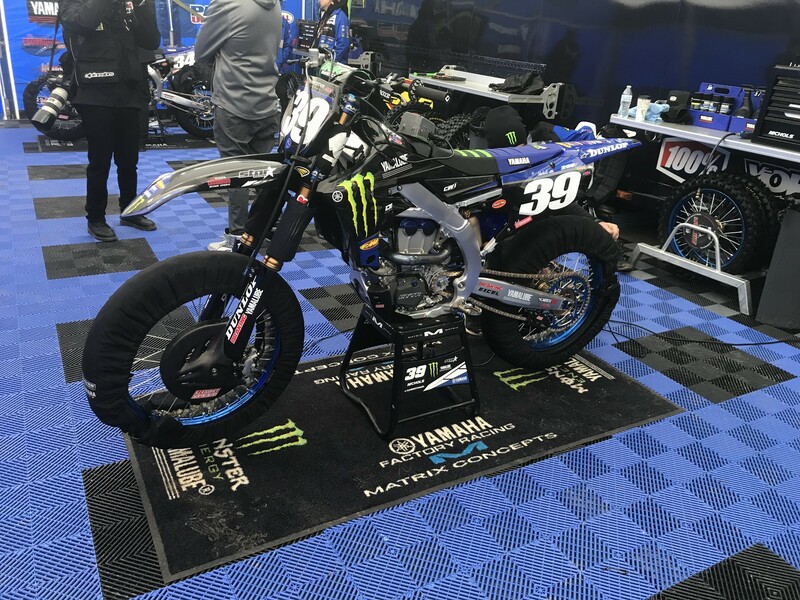 Track was way slippery by the time the 250SX A group came out for timed practice, and that cost Dylan Ferrandis, who bounced off a jump, went off the track, and then crashed on the super slick plywood on the side of the track. He was lucky to have not twisted his knee in an awkward fall. Ferrandis did come back to log solid laps and take third fastest in the session. The 250 rider to watch in these practices has been Colt Nichols, who was fastest in the free practice and again in this timed session. Adam Cianciarulo made a run but was second best. By the way, Jacob Hayes has pulled out of the event after dealing with a hand injury the last few weeks. Dean Wilson continues to channel his old “we can work with speed” pace in practice, he led the first timed 450 session here for awhile and looked smooth doing it. Eli Tomac is determined here in front of his home-state fans, though, and he took the top time away. Wilson came back on the very last lap to take it back! Couple other riders to watch include Justin Bogle, who was fifth fastest and was one of the few experimenting with a table-to-triple in the longest rhythm lane. Bogle also threw in some leg swag via some big whips over the finish line. The last few weeks, Bogle has been making big strides in speed. Ken Roczen has also been fast lately, however, his strong point has been the whoops, and they’re pretty tame here. Roczen was sixth in this session. Ben Lamay, now riding for Smart Top/Bull Frog Spas MCR Honda, was tenth fastest, and looked good. Joey Savatgy will be racing tonight with a sore shoulder, and was 13th quickest. Snow has now stopped and the sun even came out for a brief moment. The track is slick but definitely not a mudder, and now the forecast looks clear. Sun is out and the track is changing rapidly, it’s now approaching dry slick in spots where it was wet slick earlier. Wet or dry, the track will require throttle control. Colt Nichols has been consistently fast all day, and he spent a lot of this session on top of the charts, just like he did in the first session. However, late, Adam Cianciarulo logged a flyer to jump to the top. Dylan Ferrandis was third. Nichols has looked strong wet or dry, he could be a real player tonight, and that’s big considering how important every point will be between Cianciarulo and Ferrandis. Eli Tomac busted out a triple out of a corner/triple onto table that no one had done, and used that to jump to the top of the board. Tomac did it again and then Ken Roczen nailed it as well. A few others finally got it down, like Marvin Musquin and Zach Osborne, but series’ leader Cooper Webb did not do it, and instead used a unique line with a triple later in the section. Tomac kept refining his laps to log the first 42 of the day, and take top qualifying time. He was beaming in his post-session interview on the podium, clearly enjoying the home-state vibes. Again, I can not stress enough how happy Eli seemed in the pits yesterday. I also saw him hanging out with some friends in the Kawi pit earlier today, and having a good time. In heat one, Cameron McAdoo held the lead off of turn one but cased a rhythm lane and handed the lead over to privateer Johnny Garcia! Colt Nichols made a quick block pass to take the lead, and then Chris Blose and Branden Leith got into a pileup, which also held up Garcia. Marchbanks also crashed in a separate incident on lap one and couldn’t get his bike restarted, sending him to the LCQ. Nichols cruised to an easy win, and Jimmy Decotis rode well to work up to second ahead of McAdoo. Garcia held on for the final transfer spot, with Blose tenth and just short after his first-lap crash. RJ Hampshire grabbed the holeshot over Dylan Ferrandis, and Adam Cianciarulo was able to sneak to the inside and emerge in third. Ferrandis bobbled in a rhythm lane on lap two and Cianciarulo shot past him to take second. Meanwhile, Michael Mosiman was rallying from fourth and started showing Ferrandis a wheel. In the end, the lead four stayed in their positions, with Cianciarulo taking a key victory over Hampshire, Ferrandis and Mosiman. In his TV interview on NBCSN, Cianciarulo said the dirt reminds him of Glendale, a race he won earlier this season, and making a few moves to get into the lead (over Ferrandis, his title rival) is good for his confidence. Justin Bogle, who has been quick in practice the last few weeks, grabbed the holeshot and immediately started checking out on his teammate Blake Baggett. Bogle rode a superb race, stretching his lead, and then holding steady to the end to take the win. Baggett did close up by the time the white flag came out, but then he lost the back end on the start of the final lap and nearly crashed, which allowed Bogle to stretch it further. Osborne snuck past Baggett for second when Blake made the mistake. Behind that came a killer battle between Musquin and Roczen. Twice Roczen appeared to have the pass made, but Musquin countered and held him off. Roczen kept trying, kept trying, kept trying, and finally Marvin made a mistake and Roczen was able to get around. By then, the lead group was long gone. Joey Savatgy got the jump heading into turn one, but Cole Seely was able to control it and take the lead. In third, Webb and Tomac had a big battle, Tomac made a pass, Webb got back inside and then shut the door to stop Tomac from getting him back. Webb then made a mistake and Tomac got inside, and they actually made contact. Webb managed to hold the spot, and then closed on Savatgy for second with Tomac all over him. The Tomac/Webb battle was incredible, Tomac was better in the whoops but Webb kept squaring him up in every corner, they raced side by side all over the track, but then Webb tried to make a move on Savatgy before the whoops, but slicing inside cost him his drive for the whoops, and Tomac shot past. Tomac made quick work of Savatgy to get away. Webb then got around Savatgy, Savatgy showed him a wheel but Webb held on for the spot. Late in the race, Tomac started to close on Seely, but he was out of time, and Seely took the win. Who had Bogle and Seely as tonight’s heat race winners? The expected trio got out front early in this one, Garrett Marchbanks, Chris Blose and Enzo Lopes. Blose kept it close with Marchbanks but didn’t push it. Blaine Silveira took the final transfer into the main. Alex Ray got the start in this one and took off. No A-Ray drama in this one, he checked out and rode well to make it to the main. Behind him, John Short and Carlen Gardner battled hard for second, Gardner got the sport. Charles Lefrancois held on for fourth over Adam Enticknap, who was Just Short. Adam Cianciarulo was lined up next to Colt Nichols on the gate, with Nichols to the inside. These two had been the fastest all day and the jump off the line would tell the story...and Cianciarulo got it. Cianciarulo looked clear heading into turn one but Michael Mosiman maneuvered through to get lead early. Nichols and Dylan Ferrandis didn’t get the starts they wanted. Jimmy Decotis was quickly to third, ahead of Cameron McAdoo, then Ferrandis and Nichols. Ferrandis blew by McAdoo in the whoops to take fourth, but by then the gap to the lead three was starting to grow. Mosiman made it tough on Cianciarulo, and Decotis stayed close in third. Finally Cianciarulo found an opening on Mosiman, but then Mosiman fought back using the inside after a triple to take the lead back. Cianciarulo squared him up before the whoops and got a drive, and he just slammed the door in time to prevent another pass. Cianciarulo began to pull away, so now it was on Ferrandis to make moves. He got Decotis and then caught Mosiman at the halfway mark. Mosiman, again, proved tough to pass. Ferrandis got him after the triple but Mosiman came back and block passed him to retake the spot. Mosiman was showing some real fight, but in the whoops and triple, Ferrandis got back around to take over second and make it stick. It was too late. Cianciarulo had it on lock, and went on to take the win. Ferrandis rode well to get to second, but his two-race streak is over, and Cianciarulo extends his points lead to eight. Nichols came through for third. Late in the race, Mosiman tipped over and got up right in front of Hampshire. He fought hard, but in the very last turn Hampshire got inside and block passed him to steal fourth. Musquin grabbed the holeshot ahead of Savatgy and Bogle, Ryan Breece, and then Tomac made a move on Webb. Tomac then passed Breece on lap two and then Bogle. It was up to Tomac to make a quick move on Savatgy to get into second and make a charge toward Musquin. It took Tomac two laps, but he then jumped to the inside of his teammate to make a block pass and take second. The fans were cheering his every move, as Tomac started to cut into Musquin’s lead. Webb wasn’t as successful moving through, as he couldn’t find a away around Bogle or Savatgy. Tomac then caught fire. He made up 1.6 seconds in one lap on Musquin, passed him in the whoops and the crowd exploded. He quickly started marching away with the lead. At the same time as Tomac passed Musquin, Webb made the move on Bogle for fourth and then went to work on Savatgy. With 13 minutes to go, Dean Wilson had a huge crash in a rhythm lane. He was slow to get up but was eventually able to get off the track and hop on the Alpinestars’ Mule for a ride back to the pits. The Savatgy/Webb battle for third was intense. Webb would make the move, then Savatgy would get him back in the whoops. Finally Webb make it stick with a block pass, but by then Bogle and Roczen were also right there. Webb started to move out in third, leaving a battle between Bogle, Savatgy and Roczen for fourth. Cole Seely had to stop in the mechanics’ area for a new front wheel, but after losing about a lap was able to get back on track. Blake Baggett eventually joined the battle, making the move on Roczen. He couldn’t get to Savatgy or Bogle, though, with Bogle holding on for a rock-solid fourth. He’s come a long way this season. Late in the race, Webb started making tracks toward Musquin and closed up quite quickly. He then made the move in the whoops to take second, which is big in the points. There was not touching Tomac though, who had dominant speed and now owns his first win streak of the season. With the win over Webb’s second, Tomac is now 18 points down with two races left in the season.